I loved the game from my first lesson,” recalls Madison Shoemaker referring to when she was eight years old and took her first tennis clinic with Jacques Joyal. Fast forward twelve years to find Madison on a full tennis scholarship at Seton Hall University where she has played Division 1 of the NCAA (National Collegiate Athletic Association) and worked at the Women’s Tennis Academy. 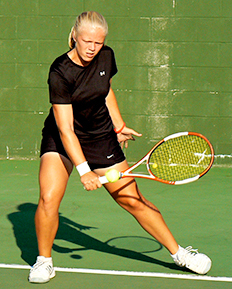 When she graduates in 2015 she has been offered an internship with the Women’s Tennis Association. Once Madison began hitting the ball, she never looked back, her accomplishments are many: by eleven she placed in the top ten in the Canadian Nationals, has attended 12 Canadian National Championships, won medals at the BC Summer Games, Western Canada Games and the Canada Summer Games. She now looks forward to a rewarding career in the sport of her choice. When she comes home to the Sunshine Coast she still loves to get out and hit the ball where it all began with a tennis lesson.